When floodwaters have affected your property, it may seem hopeless to reclaim much of it. Your carpets may seem ruined, and your building’s structural material could appear soaked and rotted beyond repair. What you may not realize is that once the water is removed, many of these items can be restored to their original state. Even wood and other water permeable materials can be completely restored, making a full recovery and giving you back your original property. You don’t have to suffer further from the flood damage by having to throw out your carpet or get rid of part of your building. Our emergency team can remove the water for you and provide effective water restoration and drying services that get you right back where you are supposed to be. Our team will work quickly and efficiently to make full repairs and to restore any items you have that are affected by the water. The sooner we are able to get in there and do our job, the more fully we will be able to restore your property. In many cases, we are able to perform a full restoration on our client’s property, but they do have to act quickly and call us as soon as they notice that they have flood damage. This allows us to begin drying and removing the water before it causes permanent damage, such as rotting. Our flood restoration services can also get rid of mould growth that can occur on carpets, rugs, furniture and structural materials. Once water gets in, the mould spores that are floating around in the air can start to take root and grow quickly, creating an unhealthy environment that can trigger allergic reactions and cause breathing difficulties. Our team is able to completely remove the mould growth after drying and make your home or business safe again. We have served Brisbane, Perth, Melbourne, Adelaide, Sydney, the Gold Coast, and its surrounding areas for some years now, and we have always worked hard to give our customers the very best service every time. Our customers depend on us to answer their emergency calls early in the morning or late at night, when flood waters damage their homes and business. They can’t wait for other competing companies to open their doors and answer their phones. 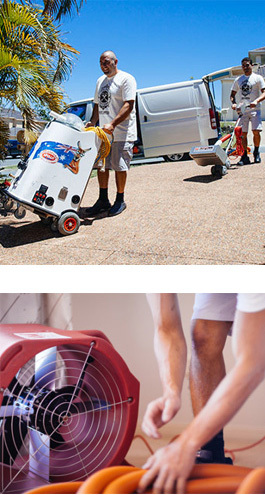 They need help drying carpets or restoration from damage caused by floods right away, and we are available 24/7, responding to our customers as soon as they call for us. You should know that you can count on us to give you excellent service every time, doing our best to fully restore your belongings and get your life back on track as quickly as possible after an emergency. It may not always be possible to fully restore everything that has been damaged by the water, but we will do our very best and ensure that you are giving nothing less than our foremost efforts. You can count on us for a fair assessment of the damage, as we determine what has been affected and how serious it is. You can also count on us to work quickly and efficiently, removing water with powerful equipment and to a greater effect than you could do on your own. You can count on us to provide you carpet drying and flood restoration services through fully trained and highly experienced personnel who know how to remove water from any surface and how to treat each item with care to ensure that it is as fully restored as possible. Whether it is drying carpets, wood, sheetrock, or any other item or surface that has been damaged by the water, we will always do our best and provide you with the finest service. We first met Bill when the insurance company sent him out. If you’re after a non nonsense guy that does what he says he is going to do than Bill’s your man. It was a very difficult situation at the time with our house being flooded, and Bill went above and beyond to help us get through it smoothly. Thank you so very much and we thoroughly recommend you to anyone.